A rather lovely little dinner last night. I followed Nigella's recipe but being a veggie I did leave out the anchovies, this is one of my 'convertible' meals as I like to call them as they are basically one meal that I can easily split out and adjust for 'meat' and 'veggie', without the need to cook 2 separate meals. For this recipe in particular I cooked the sauce and pasta and put some veggie and beef meatballs in the oven whilst the sauce was bubbling away. My hubs needs more than pasta and sauce as an evening meal and so I decided to add the meatballs which I had in the freezer, as he was having some I popped some veggie ones in the oven too for me. Although when I cook this again I won't bother for me as it was too much to be honest! 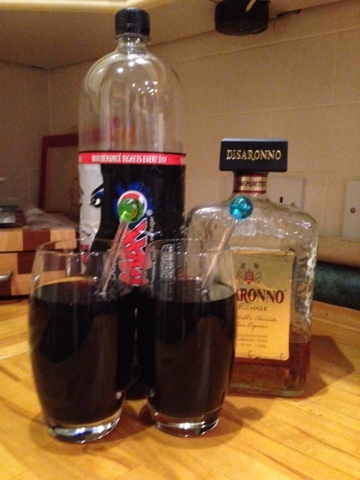 As a little treat I served this with a lovely alcoholic dr pepper, which I made by mixing disarono and Pepsi max, 25ml disarono to 250ml Pepsi max, I have seen versions online that also add beer but I'm happy with the taste without it.